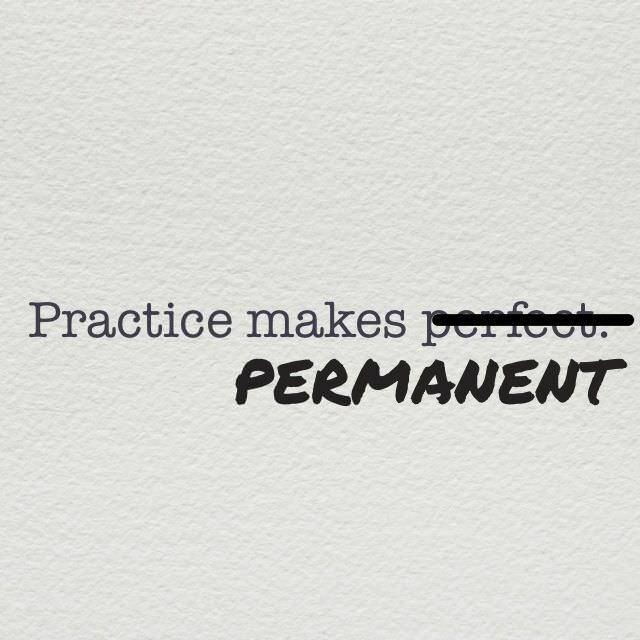 Forget the saying “practice makes perfect” and change your thinking to “practice makes permanent.” Photo. Throw it out the window. Perfect and permanent are two very different things. From an early age in school, sports and other activities, children are taught that practice makes perfect, but that’s simply not true. 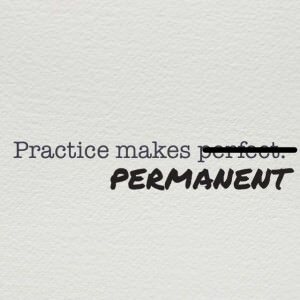 Practice certainly makes you better at something, but perfection is not always attainable. Because permanence is all about forming habits. Sitting in front of the TV with a bag of potato chips as a way to decompress from the day. Drinking soda as my main way to stay hydrated. Hitting the snooze button a hundred times each morning. Procrastinating projects leading to major stress. Waking up earlier and discovering that mornings are my most productive time of day. Exercising and making running, yoga and other forms of exercise an important part of my life. Shopping for healthy food each Sunday to help me eat better throughout the week. Always keeping a water bottle close by and drinking several glasses of water a day. Improving my writing skills by doing it every single day. Establishing good habits and maintaining them in the long term isn’t easy. In fact, it can actually be pretty uncomfortable. Forming habits takes perseverance, resolve and willpower. 1. Don’t give up- forming habits takes time. Research once showed that it takes 21 days to form a habit. Myth-busting time: lots of newer studies are proving that theory wrong. In fact, one study shows that it actually takes 66 days to make something a part of your daily life so much that it becomes automatic. I personally thought 21 days was a long time, but obviously 66 days is even longer and requires a certain amount of willpower. The key here is to PUSH THROUGH the discomfort. Example: When I began my journey to lose weight and get healthy three years ago, I really didn’t start seeing results until a couple of months in. Those first few months were tough; it’s hard to push yourself to hit the gym multiple times a week when you don’t have anything to show for it yet. However, I continued going to the gym because I knew it was what I needed to do to get the results I wanted. Slowly, after many days and weeks went by, the results of my good habits started kicking in, making it easier for me to continue reaching my goal. 2. Stay positive. I love the way this Forbes article breaks down the habit forming process. Like anything (new relationship, new hobby, new job, etc.) there’s a honeymoon stage. For the first couple of days, you’re all about achieving your goal. Trying to lose weight? Eating healthy and hitting the gym are usually pretty easy at the very beginning. But the honeymoon phase can wear off fast. And THIS is when you need the most resolve and positivity. Example: About two months ago, I started attending hot yoga classes regularly. I’m newer to yoga, so I’m still learning the language and how to do certain poses. I LOVE going to class, but now that I’m a couple of weeks in, I’m seeing improvement, but not as much as I would like. I see other people in class doing hand stands and twisting themselves into complicated poses when I can still barely touch my toes. Instead of getting discouraged, I’m choosing to be encouraged by the major progress I have made and I’m looking at every new class I attend as a win and a step in the right direction. 3. Get an accountability buddy. Make your habits public and say them out loud; when you do, you are accountable, not only to yourself, but also to the people with whom you share your goals. If you’re not comfortable shouting your goal out for the world to hear, at least have one person, an accountability buddy, that you can share your goal, action steps, weaknesses and successes with. Example: I’m part of a mastermind group that meets twice a month to discuss our business ideas and goals. We keep in constant contact through an active Facebook group where we continue to share ideas and help each other through issues we may be facing in our projects. Having this amazing group to lean on not only inspires me, but also pushes me to actually do the things I say I want to do. Knowing that these ladies have heard me say my goals out loud and are waiting for me to deliver pushes me to actually move those projects forward. Have any other tips for establishing and maintaining a habit? What are some bad habits you’re trying to get rid of and some good habits you’ve established? Share in the comments below! Want more gutsy content delivered straight to your inbox twice a month? 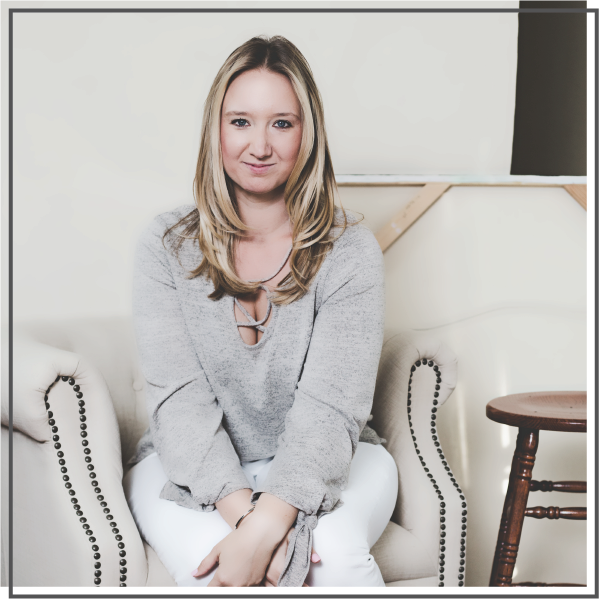 Be sure to sign up for my FREE #Get Gutsy e-newsletter filled with inspiration, ideas and action items to get out of your comfort zone.